There's a legend about Comte Maugiron who owned the steeply terraced hills of Cote Rotie. He was blessed with two beautiful daughters, one a blonde, the other brunette. When the good Count retired he passed the two Cotes to his daughters. They are still referred to as Cote Blonde and Cote Brune. Head's Blonde comes from a single vineyard at Stonewell, a site of sandy loam mixed with quartz over limestone base, unique blonde soils, which translate into a wine of accentuated perfume and profound complexity. 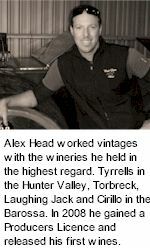 Alex Head has long been interested in Rhone Valley wines and their symbiosis with all things culinary. In particular, Shiraz from Rhone Valley's Cote Rotie. Head worked vintage with the wineries he held in the highest regard. Tyrrells and Torbreck, Laughing Jack and Cirillo. To create a unique old world style of Barossa Valley wine, Alex Head has selected a vineyard similar to Côte Rotie, where the soils produce contrasting styles of fruit. Our beautiful Blonde has been treated to the luxury of whole bunch ferments, daily foot treading over the course of a fortnight, hand plunging and pumpovers, followed by a year's maturation in an extravagantly high proportion of new 300L French hogsheads. A deeply coloured wine. Fragrant camomile and star anise, blackberry and bramble aromas with some underlying savoury notes. The palate is generous and minerally with blackberry, liquorice and sage flavours over fine loose knit grainy tannins. Archetypal Stonewell Shiraz, with highly perfumed fruit, plenty of substance and great length of flavour, will continue to evolve middle palate richness.